Researchers at the Cancer Science Institute of Singapore (CSI Singapore) at the National University of Singapore (NUS) have identified a novel molecular pathway by which a tumour suppressor, TIP60, inhibits the growth of cancer cells. 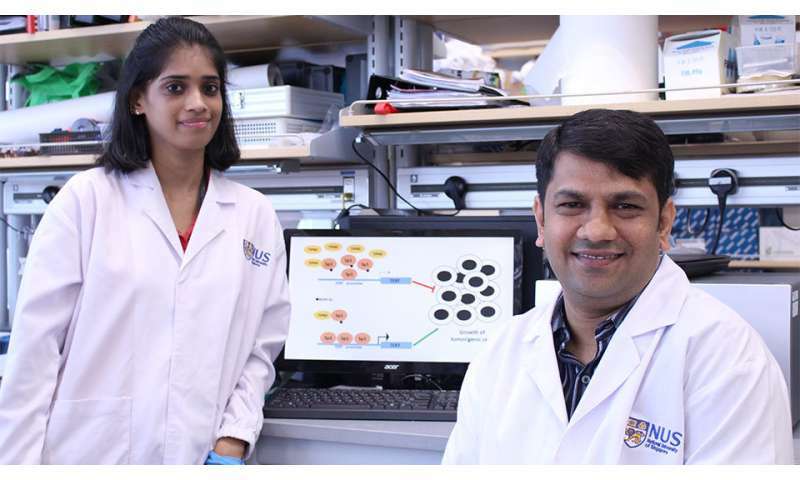 The study led by Dr Sudhakar Jha, Principal Investigator at CSI Singapore and Deepa Rajagopalan, PhD student at NUS, paves the way for the development of new therapeutic strategies that could impede the spread of virus-induced cancers. Dr Jha said, "Our findings hold exciting potential in the fight against a range of virus-induced cancers including cervical cancer, liver cancer and Burkitt's Lymphoma. Given that 85 per cent of cancers are triggered by high amounts of telomerase, our study, which lends a deeper insight into the inhibition of telomerase by TIP60, could also be applied to other groups of cancer such as breast, colorectal and ovarian cancer. Our next step is therefore to investigate the new pathway in these groups of cancer."